Why are we calling attention to this program? The improper disposal of fats, oil, and greases (FOG) by residents and businesses is increasing. The Galveston Bay Foundation wants to encourage residents to take action and stop pouring FOG down the kitchen sink with the purpose of reducing sanitary sewer overflows (SSOs). SSOs from buildups of fats, oils, and greases in our pipes result in harmful bacteria being introduced into the waters of Galveston Bay. Aging infrastructure, combined with improper disposal of FOG in single and multi-family homes, can also lead to costly problems for both local governments and citizens in terms of sewer lines, home plumbing repairs, and environmental remediation. What’s the difference between oil and grease? The terms are often used interchangeably, but they are very different substances. What are the common mistakes people make when disposing of FOG? When many people are finished cooking, they tend to dump left-over cooking grease, oils, and leftover food scraps down the sink and simply turn on the garbage disposal. Another common mistake is rinsing dishes in the sink with hot water to remove the grease residue left on plates. Grease makes its way into city sanitary sewer pipes when things like oil, butter, shortening, food scraps, and even some sauces are washed down the sink drain. Improper disposal of fats, oil, and greases can result in blockages in city sanitary sewer lines and home pipes. This can lead to extensive property damage and foul odors due to back up pipes. 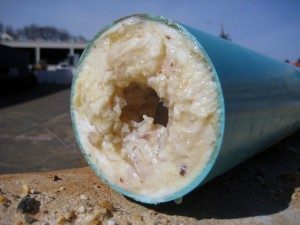 These pipe blockages can also cause sewer overflows, which spill raw sewage and introduce harmful bacteria into our water resources, parks, playgrounds, streets, and homes. What can I do to help the problem? Take the pledge to Cease the Grease in your household! Email Kaitlin Grable at kgrable@galvbay.org.